Taking stock of insights that continue to shape government reform. 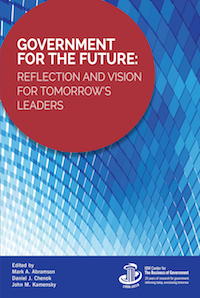 Last week marked the final installment in the IBM Center’s multipart series outlining key findings from our recent book, Government For The Future: Reflection and Vision for Tomorrow’s Leaders. In developing this book, we set out to offer a set of scenarios for how government could improve over the next 20 years, informed by lessons learned about government reform in the last two decades – lessons that the IBM Center has written about during our own 20-year journey since 1998, through some 350 reports and over 500 interviews with leaders. At the outset of this initiative, we noted the positive contribution of government that recent times have shown to be of great import to the health of nations in the 21st century. At any given moment in time, governments in the United States and around the globe are carrying out key missions in service of their citizens, learning from and engaging with partners in other sectors, and acting as cost-effective stewards of public resources. The countless positive daily actions of government leaders go largely unrecognized amidst a constant focus on the highly visible but far smaller set of challenges and problems faced by the public sector. However, stepping back to view progress over a span of decades reveals evidence of the sum total of this continuous evolution in government management—as well as providing perspective on the future of public service. It is from this longer-term perspective about the performance and potential for government that the IBM Center for The Business of Government wrote the book. Citizens will drive government services and performance. Government delivery will be carried out by multi-organizational networks. Technology platforms will enable integration of new innovation. Volunteers will support government activity. We remain grateful for the contributions of the co-authors and reviewers of Government For The Future. Their insights enabled the shaping of a book that has been the subject of multiple articles and interviews, and continues to be leveraged as a teaching resource in public management schools and an informative briefing resource for government agencies. The book is entering a second printing, available at Roman & Littlefield. We welcome continued dialogue on how best to help government move forward, informed by experience of the many leaders whose activities provide a rich repository of lessons learned and effective practices.